Bill Bellmer forwarded this amazing Mystery Foto from the collection of historian Vincent Seyfried. The caption on the photo is "Rocky Hill Rd at entrance to Motor Parkway Queens Village". 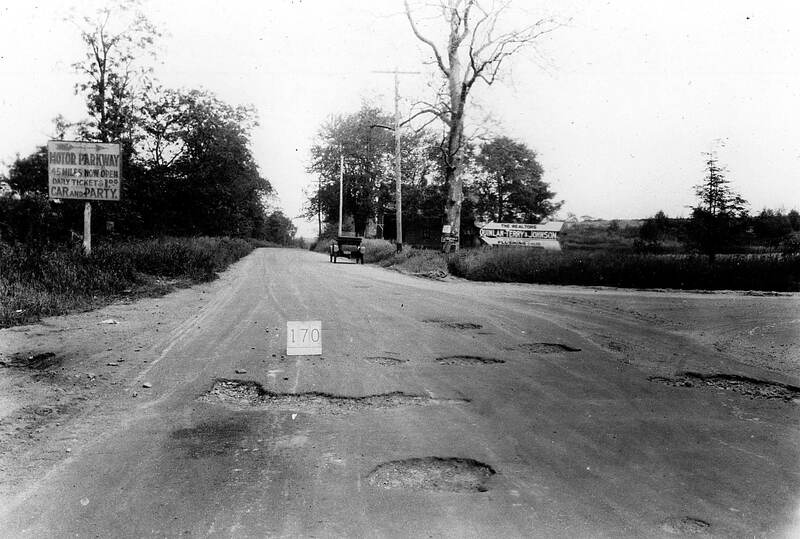 This was the Western Terminus of the Long Island Motor Parkway at pot-holed filled Rocky Hill Road (Springfield Boulevard) from 1912 to 1926. When was this photo taken? Provide a rationale for your suggested period of time. Best guess is the photo was taken sometime from 1917 to July 15, 1924. 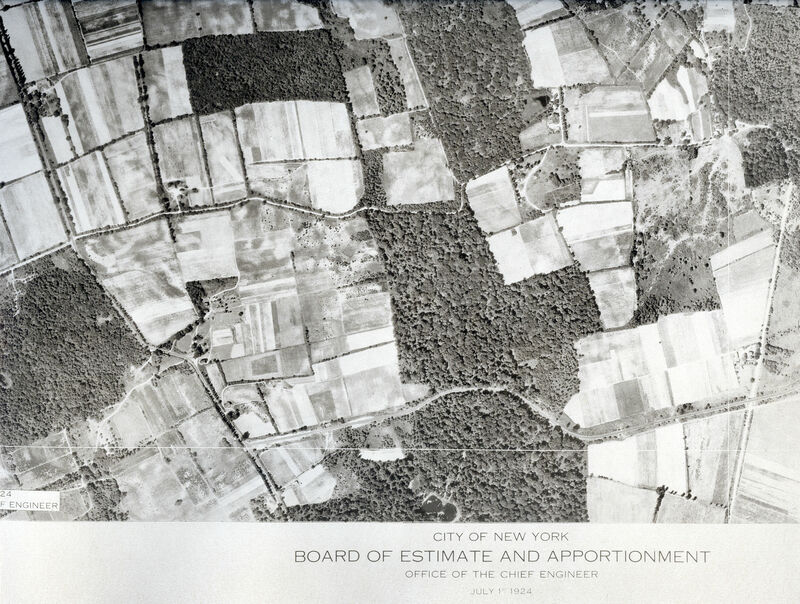 -A New York City aerial indicated that construction had not begun on the section of the Motor Parkway west of Rocky Hill Road as of July 15, 1924. -The toll fee on the Motor Parkway was reduced to $1 in 1917. Provide background on Quinlan-Terry & Johnson. 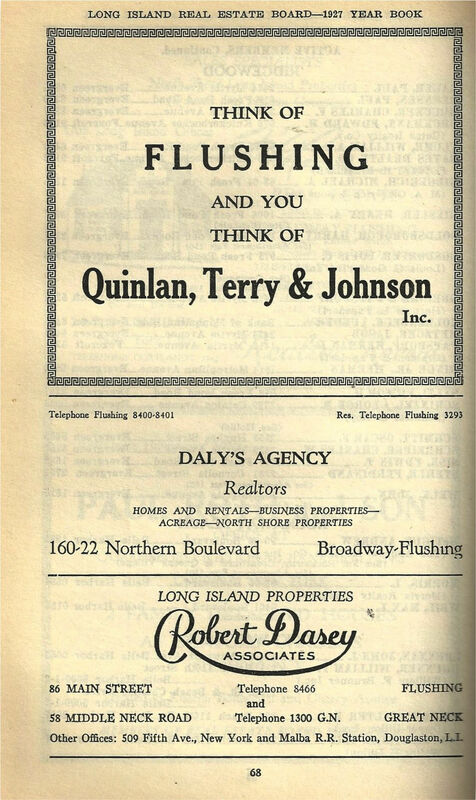 Quinlan,Terry & Johnson was a leading Queens real estate broker specializing in Flushing from the 1920s to the 1940s. The firm was established in 1876. See below. 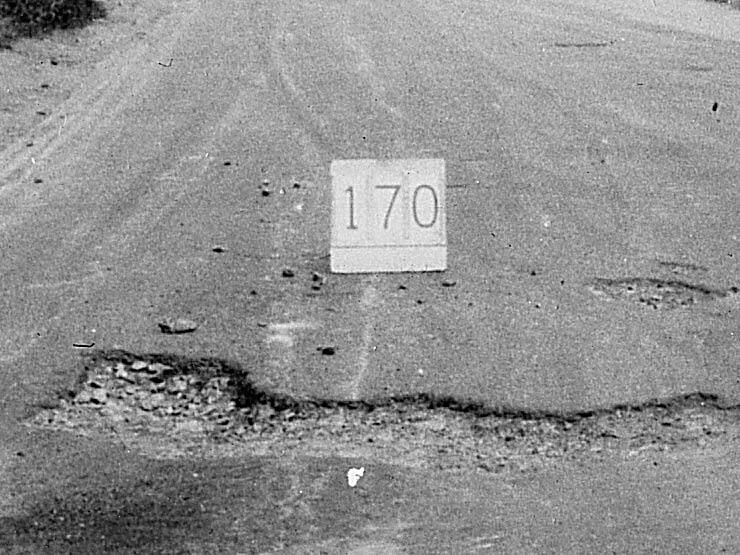 Why was a sign with #170 on the road? Best guess is this was used by the photographer to indicate his location. Congrats to Mitch Kaften, Roy Warner, Tim Ivers and Frank Femenias (see below Femenias's Findings) for identifying this challenging Mystery Foto. Kudos to Frank Femenias, Art Keiner and Steve Lucas for forwarding the below supporting documents to Howard@Kroplick.com . Rocky Hill Road can be sen heading north on the left. 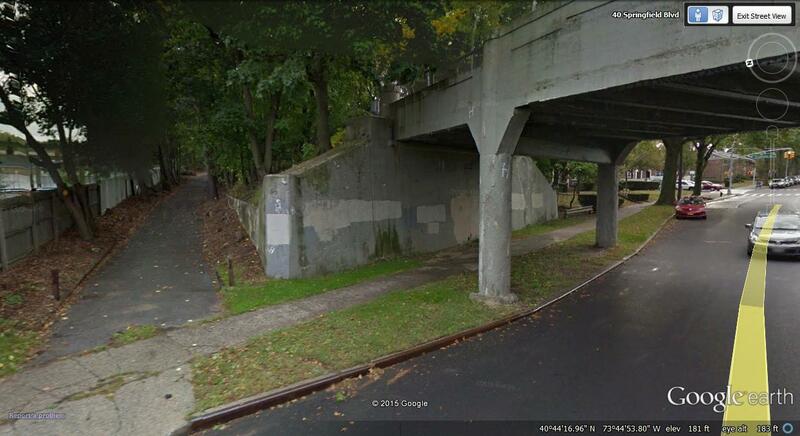 The Motor Parkway is across the bottom. Location of the Mystery Foto today. Rocky Hill Road south ramp to the Motor Parkway today. Rocky Hill Road north ramp to the Motor Parkway today. Rocky Hill Road bridge today. Bend in the road today. Bend in the road mystery house is gone today. Only a guess. Rocky Hill Rd. I don’t know the location, but did know Vincent Seyfreid. Vince was an amazing historian, that used original local newspapers as a primary source for information. When many libraries were transferring their newspaper collections to film, they were throwing away the bound newspapers they had saved for decades. Vin rescued these and stored as many as possible in the basement of his house in Garden City. When I got to know him after I became Floral Park Village Historian (we would attend APHNYS meetings here on long island) he offered to give the newly formed Floral Park Historical Society the bound copies of our local newspaper that dated from the 1920s he had rescued 30 years before. He thought it pretty neat that I came to collect them with my wife and little son in our 37 Packard super 8 limousine. Before he sold his house and moved to Franklin Square he called me to come over and gave me a solid brass ceiling light fixture that he told me came out of one of the first electric trains to run on the LIRR (ca 1909) he had obtained many many decades before. I was taken aback by this kind gesture of friendship . Vince was a Historian’s Historian. I found a few images of trolleys in the Floral Park Village archives and copied them and gave them to him thinking it would be another view of material he already had, and he was thrilled as one showed a trolley car he knew had run down Jericho Tpke. but he had never been able to find a photograph of in all his years of research. Howard, like you, he truly cherished the information, photographs etc. that he had collected over the years and shared them with many many people in his books. Apparently near Flushing in Queens, according to the realtor’s sign. Love this incredible photo (pot holes and all)! In the process of identifying its location. Good luck everyone. Hello everyone. Not totally confident with my guess, but here goes. I’m thinking this is the LIMPS final western terminus at Nassau Blvd in 1928. 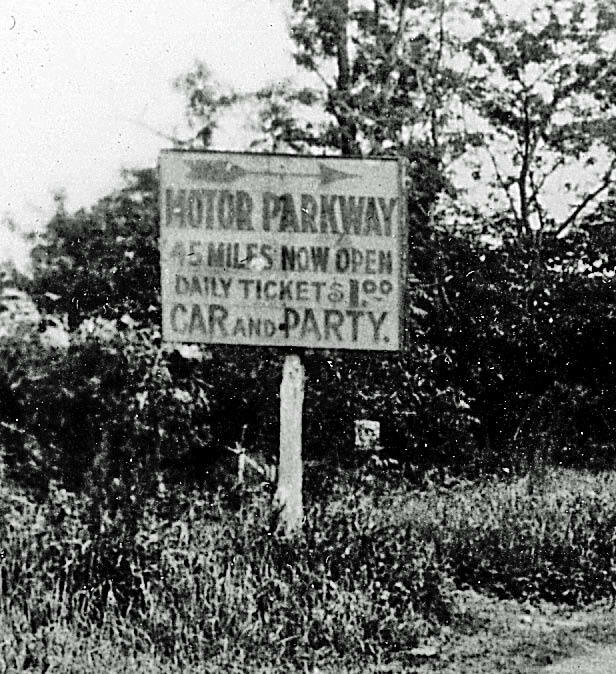 By this time period, the toll price was $1.00; and the Motor Pkwy sign advertises this amount. The large LIMP sign that will be on the E/S isn’t constructed yet, nor the booth that will be in center of the LIMPs roadway. Maybe Nassau Blvd was run down a bit at the time, perhaps the 170 sign is some type of roadwork marker. 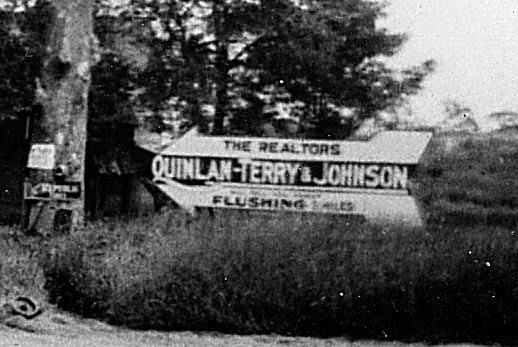 After searching Quinlan-Terry & Johnson, an old article came up about local mansion owners in this area asking to have apartments constructed on their property. This real estate firm suggested converting their mansions into apartment buildings. I ‘ve read the LIMP is 44 or almost 48 miles, the sign states 45 miles. If this isn’t what I’m guessing, I won’t be shocked. Good luck to all. I’m going to take a wild guess that this is the entrance to the LIMP off Rocky Hill Road. The toll became $1 in 1917 so it would have to be after that date, and probably before the western extension (eventually to Fresh Meadows) was started in the mid-1920s. I leave the details to the experts. 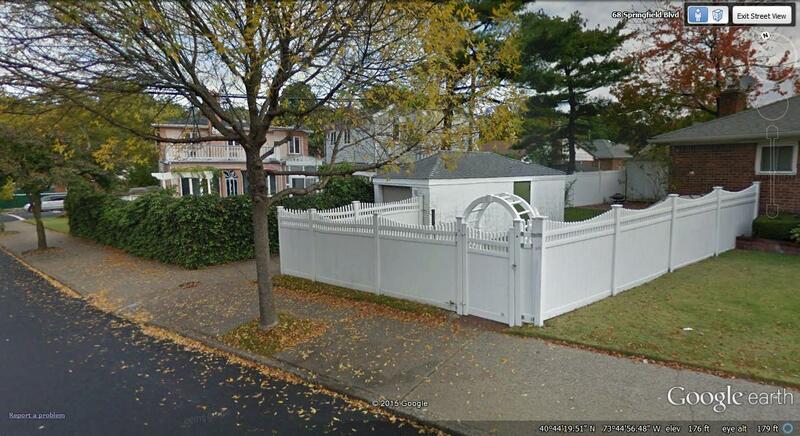 I grew up in Fresh Meadows. So knowing Queens, the potholes are a dead give-a-way. The location is in Queens. But where? 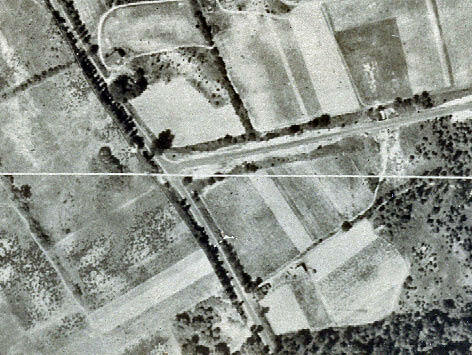 The Fresh Meadows extension was completed in 1926 (the cornerstone of the 73rd Ave overpass); it was Black Stump Rd. way before my time. The Motor Parkway sign indicates “now open” and the realtor sign states “Flushing.” which I’m assuming meant downtown Flushing, not the “town” which extended from Corona to the Little Neck border with Nassau County. 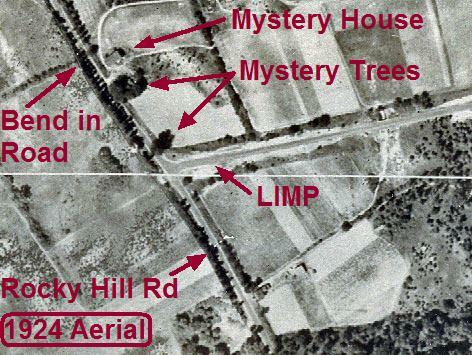 I grew up near the remnant of the old Rocky Hill Rd (between Francis Lewis Blvd and Bell Blvd.) Rocky Hill in my time became 47th and then 46th Avenues. The buses I used took the road to downtown Flushing. So my guess is that the road is Rocky Hill Rd., looking northbound, at what was then the terminus of the Motor Parkway in 1924, before it was extended to Fresh Meadows in 1926 to meet up with the newly built Nassau (Horace Harding) Blvd. I don’t remember the name of the realty company. I also surmise that the sign is not a sign on the road, but is something that was superimposed on the photo either by the City of New York to provide a tax photo or by the Motor Parkway staff. I’m going to take a few wild guesses since I’m running out of research time due to my grandson’s 8th. birthday and the associated chaos. Location: Nassau Blvd. (later Horace Harding Blvd.) looking east at the recently opened western entrance to the L.I.M.P. sometime around late 1926. The reason for the “170” sign could be to indicate a specific location requiring extensive repairs in anticipation of the NYS route numbering system starting within the next year or two. 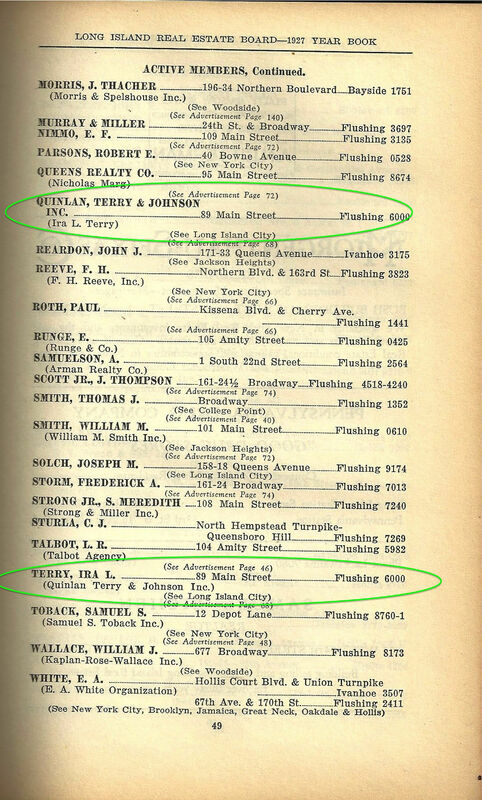 Quinlan, Terry & Johnson was probably the largest real estate agency in the area at the time and were responsible for helping to develop large portions of northern and western Queens County. 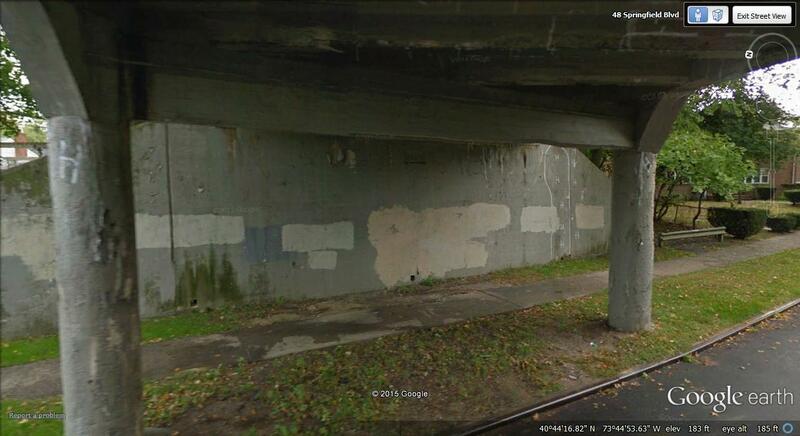 My complete guess would be possibly on North Hempstead Tpke (or another local road) in Fresh Meadows, Queens. 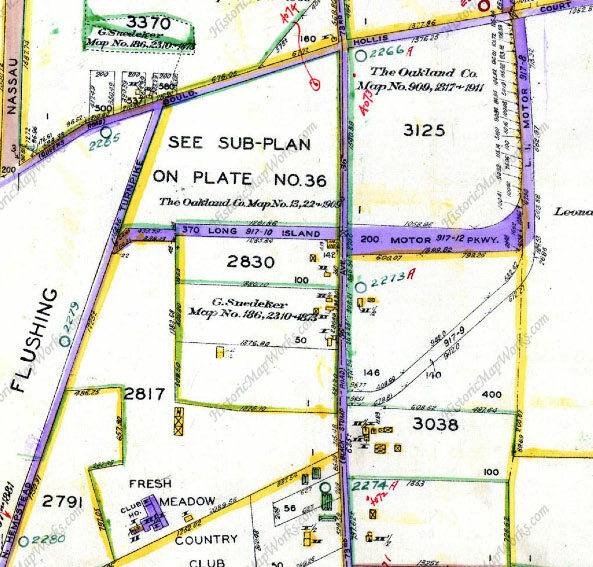 In 1917-1933 the LIMP toll was $1, but this was probably after 1924 when the LIMP was extended to the Fresh Meadows Western Terminus located off Nassau Boulevard. Unsure, other than what the billboard obviously describes as a realtor in nearby Flushing, Queens. No clue. Maybe this was a photo to denote location/identity for the city to repair potholes? Springfield Boulevard northbound at LIMP. 1917 when toll was reduce to a dollar. 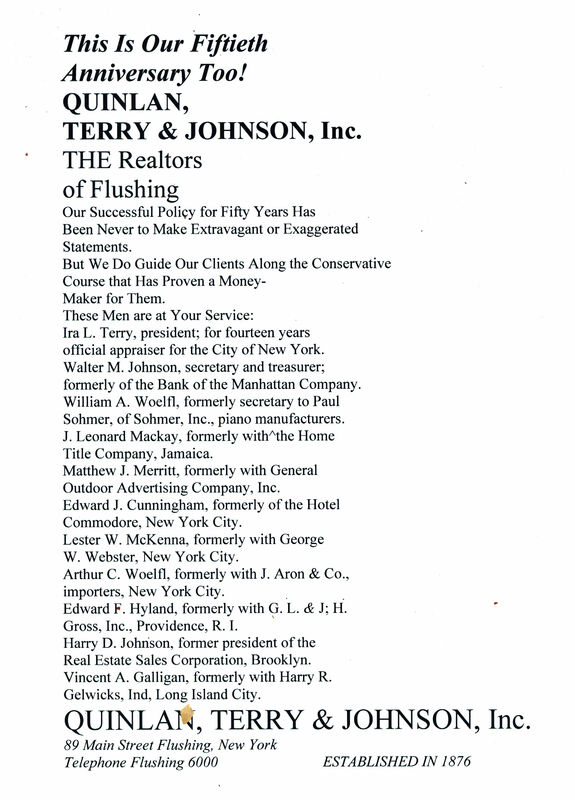 Quinlan Terry and Johnson was the name of the realty company which was the largest in Queens at that time. 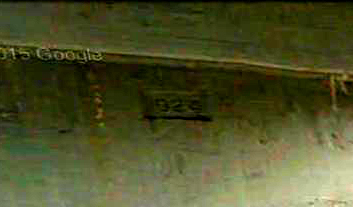 # 170 was a surveyor’s marking. The vehicle to the side of the road might be the surveyor’s. This location could be the “Birthplace of Gridlock”, Motor Parkway’s western terminus (1917-1924) at Rocky Hill Road and the LIMP, looking north on RHR. The expensive parkway tolls being collected however, scared motorists away from here instead. The slight right bend just up ahead next to the house is still visible today on Springfield Blvd. The toll reduction to $1.00 began in 1917. 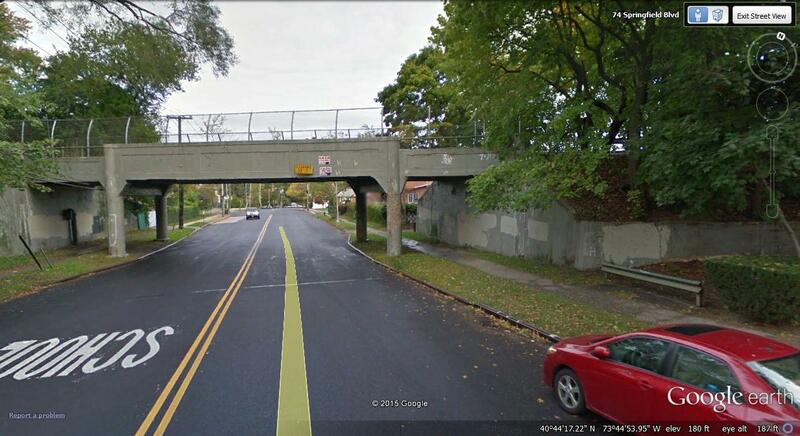 The Springfield Blvd/Motor Pkwy bridge that now resides here was built in 1924. 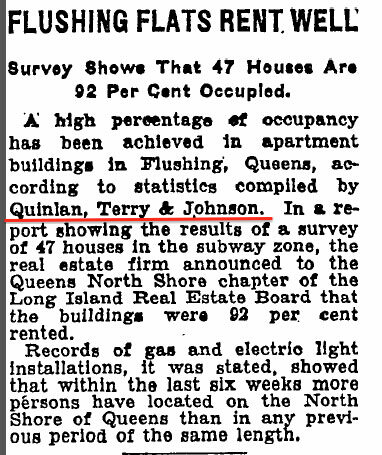 Quinlan and Francis Terry/Walter Johnson is an internationally recognized English architect/realtor that had offices in Flushing at the time. http://www.qftarchitects.com/. Quinlan was the General Appraiser for the city in real property in Queens. Rocky Hill Road/48th Ave snake right into the heart of Flushing. What better location to post your advertisment! I believe that’s a highway official parked on the right that photographed our mystery this week, responsible with the daunting task of documenting future road maintenance yet to be performed in Queens. Hopefully not too far in the future. Hoping this photo came with captioning to confirm its location. That would be neat. Howard, I’m sending over some pics. Howard - Interesting one this week. See Kleiner’s Korner for more. Walt - thanks for the info. on Vincent Seyfreid - my kind of guy!!! 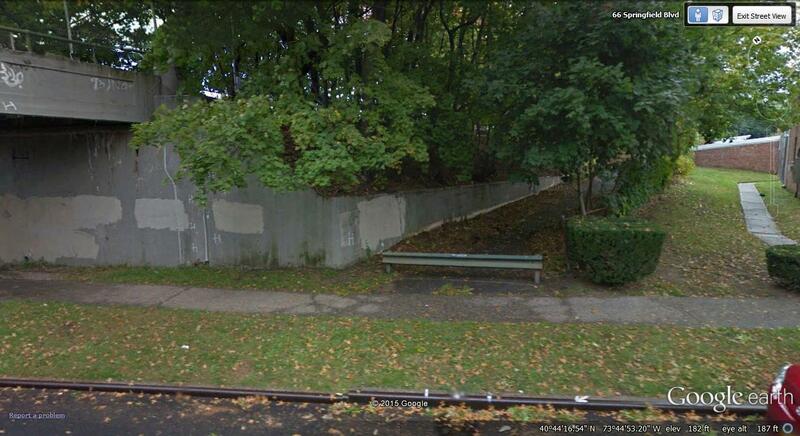 Would have to guess near the western termimus of the Motor Parkway in Fresh Meadows. 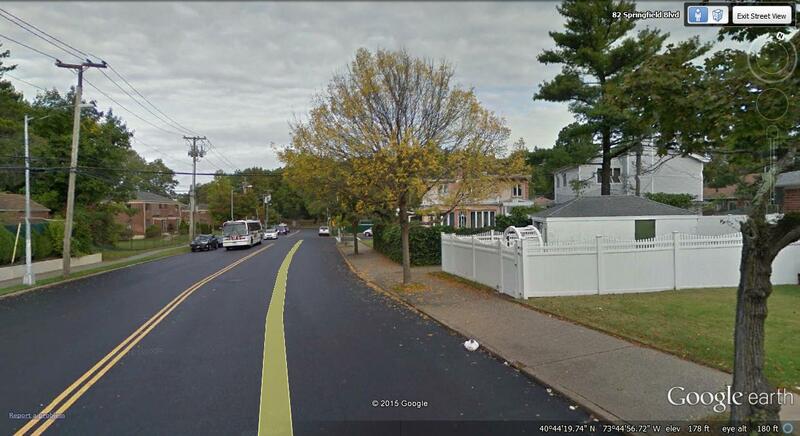 Intersection might be with Nassau Blvd./North Hempstead Turnpike (Horace Harding). 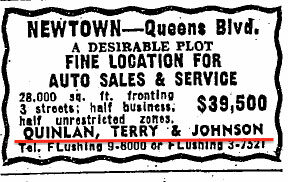 $1 toll was in effect from 1917-1933; Quinlan, Terry & Johnson was very active in Flushing real estate in the 20s and 30s, (see following answer) so I’m guessing the photo was taken in the mid-late 20s. 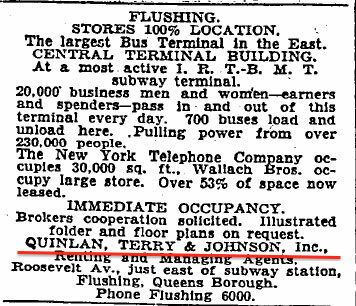 (1927 telephone # Flushing 6000) and 250 Jackson Avenue in Long Island City/Astoria (1927 telephone # Stillwell 6489). Would guess that since there were numerous potholes the 170 might have indicated a marking for road crews for repair purposes. Hi Howard, Several responders to the mystery photo this week state the $1.00 toll fee went into effect in 1917. Actually there was a dollar fee in effect for the first time on May 27, 1910. Vanderbilt had written Kienzle on May 10, to reduce the fee to one dollar by over stamping the $2.00 printed fee on the toll receipts. Several examples of over stamped toll tickets exist. Starting in 1911 there were several variations of toll fees . These were determined by how far you went, if it was one way or round trip, even an over night fee. The Parkway even had a reduced fee if you traveled between 6 am and 6 pm in 1911. There was a special fee of 50 cents in May of 1912 between the Hillside Lodge on Rocky Hill Road and the Meadow Brook Lodge for motorists attending the International Polo matches held at the Meadow Brook Club that year. On August 11, 1915 Vanderbilt wrote Kienzle to eliminate all variations of the daily fee rates and sell only $1.00 tickets effective September 1, 1915 By the way, the fee for motorcycles was fifty cents. I like the then and now pictures the best. That way you can really examine the differences. I also like the way the photographer carefully takes the now picture to match it as good as possible. Keep them coming!